It’s true; we LOVE having the Peggy R. McConnell Arts Center in Worthington. From its impressive exhibits and extensive lineup of classes and workshops to its many special events, concerts and theater presentations, the MAC has something for everyone to enjoy. Thanks to the MAC’s convenient location, folks can easily grab a bite to eat before or after an event. Although the Arts Center does not serve food, the friendly staff loves to point people in the direction of a great meal. Here are a few places to try the next time you visit the MAC. Dewey’s Pizza – Boasting 22 locations in the Midwest, it’s easy to see why so many people are talking about Dewey’s Pizza. The restaurant serves specialty pizzas, delicious salads and a rotating selection of local craft beers and wines. Bring the whole family or grab a pie to go! Best Tip: Check out their seasonal menu; it’s loaded with delicious fall flavors like pumpkin, bacon and fig jam! The Old Bag of Nails – A quintessential neighborhood restaurant, The Old Bag of Nails is known for classic, pub-style dishes like burgers, beer-battered pickles and their famous fish and chips. Guests also love their full bar, kid’s menu and gluten-free options. Best Tip: Recently voted the best happy hour in Columbus, stop in Monday through Friday from 2 to 7 p.m. for “Happy Hour $2 You” specials. Harold’s American Grille – Worthington’s newest restaurant, Harold’s American Grille, features a classic menu filled with local ingredients. The family-friendly atmosphere, delicious dishes and extensive list of wine and spirits are guaranteed to make this your go-to destination. Best Tip: Try the fish sliders! 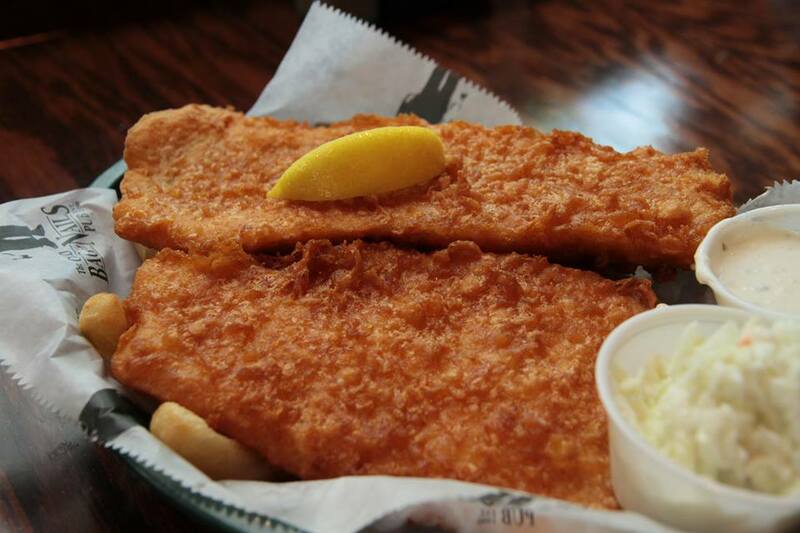 They’re inspired by the famous fish sandwiches at Coleman’s Fish Market in Wheeling, West Virginia, and a favorite of the restaurant’s owner, Sam Baker. La Chatelaine – Worthington’s favorite French bakery and bistro, La Chatelaine serves traditional fare. Think Duck confit cassoulet and Boeuf Bourguignon served in a lovely, French-country setting. Folks also enjoy the classic charcuterie, homemade bread and decadent desserts. Best Tip: La Chatelaine’s owners, Stan and Gigi Wielezynski, traveled throughout France, Spain and Italy, hand-selecting small wine producers to create their own in-house red and white wine. Stop in for a taste. The Whitney House – Inspired by the good old-fashioned Sunday dinner, The Whitney House offers rustic-yet-refined cuisine that’s locally sourced and packed with flavor. The restaurant has been open for less than a year, and it's already become a local favorite. Best Tip: The Whitney House features a different “Daily Plate” special each day of the week, and you’ll want to try them all. Fried chicken Sundays? Yes please! Rivage Atlantique – If you’re in the mood for seafood, Rivage Atlantique is the place to be. Featuring fresh, wild-caught seafood direct from the Atlantic Ocean, Rivage Atlantique is the closest you’ll get to seaside dining. Best Tip: In addition to the main dining room, you’ll love The Back Room with its gastropub menu. Happy hour specials include $2 off beer, wine and house liquor, and $5 small plates. The Worthington Inn – A landmark in the community since 1831, The Worthington Inn features a gourmet menu filled with locally sourced ingredients. Guests can enjoy al fresco dining on the patio (while it’s still warm), a quiet evening in the historic dining room or a relaxed meal in the Pub. Best Tip: Check out the restaurant’s exciting list of special events, including wine pairing dinners, live musical performances and holiday parties. House Wine – House Wine offers more than 500 carefully selected labels in stock, making it Worthington's go-to source for both the novice and the aficionado. With 24 different pours from the shop’s Enomatic wine dispensers, you’ll have a hard time deciding on a favorite. Best tip: Feel like sharing a bottle? House Wine’s corkage fee is only $5 – the best deal in town! Graeter’s Ice Cream – Graeter's is the only commercial ice cream manufacturer in the world that still uses small-batch, French pot freezers, creating handmade ice cream that is thick, rich and irresistible. Stop in for a scoop of your favorite flavor or sample one of the seasonal features. Best Tip: Trying to cut down on your sugar intake? Try Graeter’s new, low-glycemic flavors. They're incredibly delicious, yet slightly less indulgent.